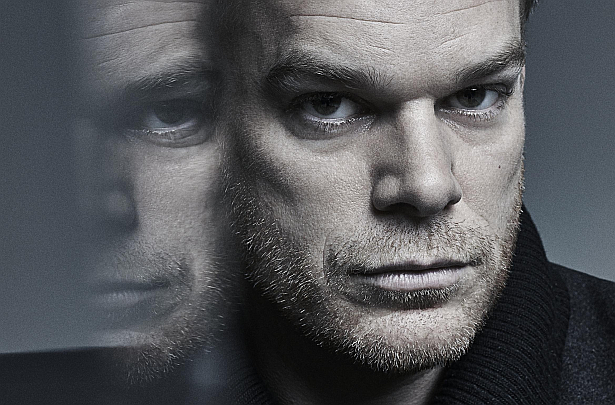 via The Guardian: You'd think that Michael C. Hall would have had enough of death. He spent five years at the embalming table as sober, self-doubting undertaker David Fisher in the HBO TV series Six Feet Under, then eight as the anti-hero of Dexter, a forensics expert with a secret life as a serial killer. The 43-year-old North Carolina-born actor has become American TV's poster boy for death – usually violent; with those series over, you'd think this would be a good time to try some nice decorous costume drama. But no: in the first 20 minutes of his new thriller Cold in July, there he is, doggedly wiping bloodstains off a living-room wall, the splashed residue of a burglar shot by Hall's anxious protagonist. When Hall walks into the darkened nightclub where we meet, on the top floor of a Cannes hotel, he is wearing a black Paul Smith suit and tie and still looks like a funeral director, albeit a rather more chic one than David Fisher. Having devoted 12 years to two characters, Hall is at last getting a chance to diversify, with considerable success. Read the full article/interview, after the jump! In Jim Mickle's Cold in July, Hall plays an everyman in a jam – an unassuming family man who, in a split-second reaction, shoots a burglar in his Texas home. Last year, he scored some indie-cinema kudos at Sundance as a murder victim in true-life Beat Generation drama Kill Your Darlings, and now he's getting raves for his Broadway performance in The Realistic Joneses alongside Marisa Tomei, Toni Colette and the actor-playwright Tracy Letts. "Mr Hall imbues his character's despair with an offhand lightness of touch," praised the New York Times. It's that lightness – the ability to bring everyday approachability and humour to roles that might otherwise seem grim – that has made Hall a leading light in the American TV drama renaissance. From 2001 to 2005, he was Six Feet Under's responsible but conflicted David, widely hailed by media commentators as American television's first realistic gay leading character. Hall's father William, who worked for IBM, died of prostate cancer aged 39, when the actor was only 11. I ask whether that early experience of loss provided any special insight when it came to Six Feet Under, a show in which bereavement was the constant theme. "Absolutely. And my parents' first child died in infancy before I was born. Death was a conscious reality for me as soon as I came online. I've maybe done more than the average amount of time in funeral homes. There's that scene in the pilot episode where David is preparing his father for the viewing, and his dead father appears over his shoulder [and says]: "Oh, no, you're doing me?" That internalised critical paternal energy was something that I definitely relate to." In manner, the saturnine, faintly academic-looking actor is closer to the solemn, contained David than the impishly feral Dexter Morgan; he leans forward on the sofa, hands clasped, speaking thoughtfully and deliberately. But that could be fatigue (he flew from New York yesterday, and must be back in time to go onstage tomorrow). When Six Feet Under ended, Hall says, "I started to feel that I wasn't being taken seriously for roles where I wasn't playing some fastidious control freak." But then came Dexter, and a different kind of fastidious. "I felt happy to be doing something that may be characterised as subversive. Some viewers get a vicarious thrill watching it, inasmuch as we all have homicidal impulses from time to time, though we don't act on it. But I don't look at Dexter and wish I were him." Some people allegedly did, though. There were cases, I say… "I know," Hall puts in ruefully… both in the US and Scandinavia, of people committing killings and claiming they were inspired by Dexter, or identified with him. Did that rattle him? "Yes, it was horrifying that someone's darker impulses were in some way spurred on by watching the show. I'm not…" Hall pauses cautiously, "trying to talk myself into anything when I say that such a personality might have found something else to reinforce whatever impulses they have. But it's horrifying to consider that something you did in hopes that it would be a meditation on the nature of morality would give the green light to do a heinous act. But it doesn't make me want to take Dexter back." While shooting the show's fourth season Hall was diagnosed with Hodgkin's lymphoma, a cancer of the immune system. He kept the diagnosis secret on set, then began chemotherapy treatment the day after that season wrapped. He decided to go public when he appeared in a knitted cap at the 2010 Golden Globes and Screen Actors Guild award ceremonies. Originally, he says: "I thought, 'Well, I can treat this successfully and if my hair falls out [which it did] I'll wear a wig during the fifth season – and I won't even have to share with anyone that this is happening.' But I thought it would be conspicuous if I showed up (at the awards) without eyebrows, and so I made an announcement. "I'm glad I did," he continues, "because I really underestimated how much that would be a source of inspiration or strength to other people. Just to see someone who you know and spend time watching, who goes through the treatment process successfully, is of value." Hall appears to have approached his illness philosophically; late in 2010, he told the New York Times: "I think I've been preoccupied since I was 11, and my father died, with the idea of the age 39: would I live that long? What would that be like? [Hall was 38 himself when diagnosed]. To discover that I had the Hodgkin's was alarming, but at the same time I felt kind of bemused, like: 'Wow. Huh. How interesting.'" Since going into remission, Hall has worked as a spokesman for the Leukaemia and Lymphoma Society. When we next speak, on the phone a week later, Hall is back in New York's West Village. His usual home is in Los Angeles, but he's living in Manhattan while he appears in The Realistic Joneses. Theatre, he says, is where he naturally feels comfortable. "Being on stage with your fellow actors has a vitality that acting on camera doesn't – there's no stopping, it's all happening right now, nobody's waiting their turn for their close-up." While it's hard to imagine either David Fisher or Dexter Morgan hoofing and crooning, Hall's theatrical roots are in the musical, going back to high school roles in Oklahoma! and the like when he was growing up in Raleigh, North Carolina. After studying acting at New York's prestigious Tisch School of the Arts, he chalked up a catalogue of Shakespeare roles off-Broadway before making his Broadway debut in two shows by Kander and Ebb, as Billy Flynn in Chicago and as Emcee in Sam Mendes's production of Cabaret; it was Mendes, in fact, who recommended him to Six Feet Under creator Alan Ball. Hall has twice been married to fellow performers – first to Amy Spanger, who co-starred with him in Chicago, then to Jennifer Carpenter, who was Dexter's sister Debra in the TV show. According to Wikipedia, he "eloped" with Carpenter – a word that has a quaint ring these days. Yes, Hall says, they did indeed "elope". "In the strictest term, I think it means that you go off and get married on your own, with whatever parties are necessary to make it legitimate and legal – perhaps to some exotic location, but that's not necessary." He explains all this with dry, studied precision; you can well imagine that he once briefly considered a law career. He and Carpenter married in December 2008 and finalised their divorce in December 2011, but continued their Dexter roles until the series ended last year. At a "Farewell to Dexter" live event in Los Angeles, the former couple were asked what it was like to carry on working together. "It was gratifying," Hall said. "It was what we needed and wanted to do." Carpenter added. "Our marriage didn't look like anyone else's, and our divorce didn't either. Just because our marriage ended doesn't mean the love did." Hall's partner now is Morgan Macgregor, a fiction writer and book reviewer who formerly worked at the Los Angeles Review of Books. Do they share literary tastes? "I suppose, though I probably benefit more from her expertise than she does from mine. She has a unique ability to place books with people, myself included, so that's a nice perk." Dexter came to an end after a final season that, frustratingly for many fans, let its anti-hero off the hook after promising an apocalyptic climax. "The show had lost some of its torque," Hall admits. Now, at any rate, he is free to explore other kinds of misfits – in Cold in July, Hall gets to play someone essentially dorky and out of his depth. "For me," he says, "this was a movie about a guy who decided to grow a moustache two weeks ago. And the moustache is not mature, and the haircut is not quite right, and the clothes are mismatched and unflattering. He's a guy whose life has happened to him, and in a way [the drama] represents an opportunity for him to happen to life." At first, the film seems to be a psychological drama; by the end, it has turned into a much broader 80s-set stew of noir Americana. With Hall's star in the ascendant beyond television, life will no doubt be different: he'll be recognised more as himself than as someone's favourite character. Did he often feel that people, spotting him in the street, were seeing not him but his small-screen selves? "Definitely. When I was playing David, people would say: 'You need to stand up for yourself.' Whereas people recognising me as Dexter may be more inclined to give me a thumbs-up." He gives a dry chuckle. "Or tell me they hated the finale."